Alright then - Welcome Weddle. While I still have some reservations, many of you raised excellent points in support of the move. It does make sense if the Rams feel they have another shot to win a title, (absolutely agree). It would also make sense if the Rams intend on drafting a DB in the high rounds (I guess we'll see). Koakoi's comments about signing Weddle before the start of free agency not counting against the Rams in terms of compensatory picks is excellent information. For the second straight year, the Los Angeles Rams are in danger of losing a key starter in the secondary. And for the second straight year, they’re addressing that possible void before free agency even begins. With Lamarcus Joyner’s contract expiring next week, the Rams are signing Eric Weddle to take his place. They took a similar approach last year with Marcus Peters and Aqib Talib being acquired to replace Trumaine Johnson. Those moves worked out last season and there’s little reason to believe the addition of Weddle won’t have a similarly positive effect. The Rams hit a home run by bringing Weddle back to Southern California where he’s not only from, but still has roots in. Weddle may be 34 years old and he may be coming off a season in which he had a career-low zero interceptions, but those numbers don’t tell the whole story. He earned an overall grade of 80.7 from Pro Football Focus last season, good for 10th among all safeties. Adding him to a secondary that currently features Peters, Talib, John Johnson III and Nickell Robey-Coleman gives the Rams immense potential in the defensive backfield. All five have great ball skills and we all know how much Wade Phillips loves turnovers. Sure, he’s lost a step from his younger days and doesn’t have the same range he once had, but Weddle is one of the smartest to ever play the position. He has tremendous eye discipline in the secondary, which is crucial for a safety as the last line of defense. And while he’s not as fast as before, he takes great angles to the ball. Missed tackles were somewhat of a concern in 2017, but in 2018 and years past, he was consistent and reliable when asked to wrap up ball carriers. Joyner offered very little as a run defender at 5-foot-8 and missed plenty of tackles, himself. The Rams are certainly upgrading in that department. But the biggest “plus” in all of this is Los Angeles’ work in the compensatory pick formula. Joyner is likely to sign a fairly large contract in free agency, potentially netting the Rams a compensatory selection in 2020. Because Weddle was released by the Ravens – like Ndamukong Suh last year – he doesn’t count toward the formula when it comes to canceling out lost players. So not only do the Rams get better at safety, but they’re also paying him about half of what they paid Joyner last season. Not to mention, they’ll likely get a compensatory pick next year. According to Ian Rapoport, the two-year deal is worth up to $12.5 million with only $5.25 million guaranteed. At most, Weddle’s salary in each of the next two years will be $6.25 million, which is a steal. The Rams could’ve waited to sign one of the big-name free agents set to hit the market next week. They could’ve gone after Earl Thomas or Adrian Amos or Ha Ha Clinton-Dix. However, all of them would’ve cost more than Weddle and would’ve hurt the Rams’ chances of getting a compensatory pick in 2020. They also could’ve waited until the draft to potentially select someone like Chauncey Gardner-Johnson, Nasir Adderley or Deionte Thompson. All are great prospects, but none have taken a single NFL snap and don’t bring the leadership that Weddle does. Essentially, he’s the defense’s version of Andrew Whitworth. The veteran left tackle came to the Rams at the tail end of his career, brought valuable experience and helped fortify a major position of need. He was a big part of the Rams’ Super Bowl run last season and Weddle hopes to have a similar impact. The Los Angeles Rams made their biggest splash of the offseason earlier Friday, signing safety Eric Weddle to a two-year deal. For a variety of reasons, it was a great move. Most importantly, it will allow the Rams to turn all their attention toward building the rest of the defense. Since Weddle was released by the Ravens before his contract expired, the Rams were able to sign him before free agency officially opens. Now, the Rams will get to go into the real free agency period knowing exactly what they have and what they need. If the Rams had gone int the the legal tampering period still looking for a safety, players at other positions would’ve been snatched up by the time they settled on what to do at safety. By signing Weddle instead of retaining last year’s starting free safety, Lamarcus Joyner, the Rams also saved a significant amount of money. The Rams signed Weddle to a two-year deal worth up to $12.5 million. They paid Joyner $11.29 million just for last season alone, meaning they’ll be getting Weddle for around half the price. The $5-plus million the Rams will be saving at the safety position from last year to this year will give them additional resources to build the defense. The Rams desperately need outside pass-rushing help, and this move makes it much easier to add it. The additional money could be used to help retain Dante Fowler Jr., an impending free agent, or a different pass rusher who will be on the open market. Aaron Donald was a one-man wrecking crew getting after the quarterback far too often, and he needs some help. A lot of analysts had been projecting the Rams to take a safety early in this April’s draft, and they no longer need to do that. The Rams can use the 31st pick on an edge rusher, or an interior offensive lineman if Rodger Saffold departs. Weddle just turned 34, but his play isn’t really dropping off. He earned an 80.7 grade from Pro Football Focus last year, which made him the 10th-highest graded safety in the NFL. It’s much better than the 73.1 grade Joyner got, and shows the Rams really don’t have to worry about the free safety spot. The Rams traded their second and third round picks in this year’s draft away as part of the Marcus Peters and Fowler Jr. trades respectively, and don’t have a ton of draft assets. Being able to remove safety as a pressing need is a huge boost, which will now allow them to use their limited draft resources elsewhere. With John Johnson III and Weddle, the Rams have one of the best safety duos in the league. It’s a great mixture of youth and experience, and they should complement each other well. The Rams’ secondary was shaky at times last season, and this is a step in the right direction. The fact that Les Snead was able to pull off an upgrade like this before free agency even opened, and for such a cheap price, is the latest feather in his cap. Rather than spending big money on a safety like Earl Thomas or using a first-round pick on one, the Los Angeles Rams filled the void expected to be left by Lamarcus Joyner in a more affordable way Friday. They signed veteran Eric Weddle to a two-year deal worth up to $12.5 million with only $5.25 million guaranteed. It’s a very affordable contract for a team that doesn’t have an abundance of cap space in 2019. Weddle, 34, said in January that he would retire if the Ravens cut him – which they did this week – but he changed his tune and is returning for at least one more year. Given his age and the fact that the Ravens released him, many are wondering if Weddle can still play. He’s been in the league for a dozen years and at 34, there’s no way he can still be as good as he was in 2011 when he was a first-team All-Pro, right? Not exactly, but he’s still one of the best safeties in the league and the numbers are there to prove it. Take a look at his career grades from Pro Football Focus and notice the consistency he’s shown from 2007 to now. His regular-season grade of 77.9 was his second-best of the last four years. He didn’t have an interception and only broke up a career-low three passes in 2018, but he was still Pro Football Focus’ 10th-highest graded safety (80.7 including playoffs) in the league last season. The stats go beyond just that single number, too. According to Next Gen Stats, Weddle allowed just 0.26 yards per coverage snap when aligned as the deep safety, which was the best in the league. Joyner, for comparison, allowed 0.35 yards per coverage snap and receivers had a full yard more of separation against Joyner than Weddle. The Rams needed a great coverage safety to replace Joyner and pair with John Johnson III, who’s best when aligned near the line of scrimmage. Weddle has proved to be a true free safety throughout his career, but he can play strong safety, too, and still lock down receivers in coverage. Weddle allowed a passer rating of only 62.8 when targeted last season, which was tied with Xavier Woods and Ronnie Harrison. Joyner ranked 25th with a passer rating against of 73.1. When he was targeted, Weddle allowed just 3.6 yards per pass that came his way. That was the best of any safety in the league last season and he was only one of six safeties to not allow a touchdown in coverage. He’s the definition of a security blanket over the top, limiting big plays and preventing touchdowns. Safeties don’t often cover wide receivers, but Weddle has experience in that department. Since 2017, Weddle has been targeted 36 times when covering wideouts. He allowed two touchdowns and picked off four passes (all in 2017), surrendering 23 catches and a passer rating of 55.6. In other words, quarterbacks had very little success when targeting wide receivers with Weddle covering them. Against the run, Weddle is also great. According to Pro Football Focus, he missed just five tackles in 78 attempts last season and had 17 total defensive stops, which was 17th-most among all safeties. Just two years ago, he missed only three tackles on 96 attempts, so he’s been reliable as a run defender his entire career. This chart backs that up with 2017 being his only poor season in the tackling department and only two seasons with a run defense grade under 71. It’s easy to be worried about his age because not many safeties play until they’re 34, let alone at a high level. But Weddle has shown in recent years that his skills haven’t diminished despite him losing a step in the speed department. His football intelligence and ability to diagnose plays make him one of the top safeties in the league. The Rams will greatly benefit from adding Weddle to the secondary. Leave it to you Nick to find the angle that is hidden behind the stats. I like that our defensive "mad scientist" Wade Phillips will have the chance to put a seasoned talent on the field with our defensive backfield. Hopefully, Michael Thomas of the Saints will not be able to get away with the type of reception that had Peters out of position in week 9. That is just one example, but there were plenty of others. I like the move and fully expect the Rams to draft a safety in this draft to learn under Weddle. BTW, I think the signing amount was !2.5, not 10.5, but what's 2 million amongst friends. Last edited by mde8352gorams; -03-09-2019, 04:16 PM. fun fact: by signing him before the start of free agency, he actually doesn't count against the new season's FA losses & acquisitions, so this move will have zero impact on compensatory pick calculations, should the Rams lose Joyner (guaranteed now), Suh, Fowler, et al. You bring up a lot of great points. I also like the notion that perhaps a veteran leader like Weddle, who some consider to be the equivalent to having a coach on the field, can only mean good things for the play of Marcus Peters and the overall communication of the defense. Almost 2 dozen NFL coaches this offseason alone have told me Eric Weddle is what made Baltimore's scheme the most challenging in football last year. Benoit works for Sports Illustrated. I agree. Obviously Weddle's best days are behind him, but this move gives the Rams some time to transition to a permanent fix while adding a savvy veteran coming off another Pro Bowl season, and help the teams 2019 campaign to get back to the Super Bowl. I like the move. I'd like to be positive about this signing, as I've always liked Weddle, but truth be told the guy is 34 years old and is coming off a year where he didn't record an interception. His best days are in the rear view mirror. Intelligence and football smarts only take you so far. So right now assuming Joyner bolts, our starters are Johnson (very solid), a 34 year old Weddle, a 33 year old Talib who spent 10 weeks on the DL and a young malcontent who ran his mouth and sucked last year (Peters). Not exactly murderer's row back there. Man I thought the same thing. The Rams are said to be high on Nasir, so I hope we still draft him & let him learn from Weddle for a year in addition to picking up a developmental CB as well. What this says to me is that Snead and McVay believe they have a defense good enough to win a championship in 2019, and don't want to burden it with inexperienced players in the defensive backfield. Especially considering there will be new young guys at LB. A db rebuild or retool is coming after 2019, when Talib is done. But for 2019, they want to take one more shot with a veteran defensive backfield led by Talib. Weddle is a contemporary, and on the same timeline. I expect they'll draft a db pretty high this year, and let him apprentice with these mature vets for a year, before stepping into a starting role. They're trying to create that kind of environment for their young players, rather than put them under stress to produce immediately, like long term successful teams do. It begs the question what will they do with Peters now. I wouldn't be surprised if they have a 1 year plan for Peters too. (Dont they still have Peters' option year?) And they really do need to maximize the value of the picks they gave for Talib and Peters. They can't just keep giving up draft picks for guys they have for only 1 season. Seeing this signing, I expect Snead is going to make a very serious effort to sign Fowler, and perhaps Suh for another season too. Perhaps Weddle will become a nice complementary player for Talib, over-the-hill entities that may be above average, above experienced DBs. I'd like to think that after 2018's experience both Talib and Weddle will turn into reliable ball hawks and real hard hitters; thinking both will make a few INTs too in addition to some welcomed leadership. If we could only support them better in the box. Now, everyone has "highlights" or course. The accompanying song here does not help though. Last edited by RealRam; -03-09-2019, 07:44 PM. Good deal. Welcome! According to Sporting News (today) Weddle had received offers from 10 other teams. Height: 5-11 / Weight: 200 lbs. Rams signed S Eric Weddle to a two-year, $10.5 million contract. That escalated quickly. Weddle was just reported to be visiting the Rams on Friday afternoon, and a deal was announced just over an hour later. The move makes sense for Weddle, who lives in Southern California and was almost certainly looking to join a contender at this stage in his career. It also makes sense for the Rams with LaMarcus Joyner headed to free agency. 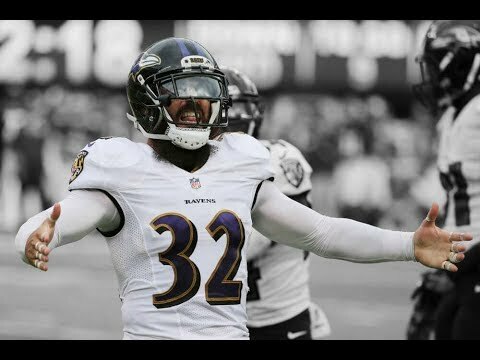 Weddle should slide right into Joyner's spot on defense moving forward. Lamarcus Joyner’s football mantra — Everybody has a plan until they get hit — was forged on the sandlots near the Victory Homes projects in Liberty City, one of Fort Lauderdale, Fla.’s rougher neighborhoods. Joyner, a gifted defensive back from Florida State selected by the Rams in the second round of the recent NFL draft, started playing football with his older brothers and their friends. He was put to the test early and came away with a toughness and an edge that prevails to this day. The second-youngest of Rose Joyner’s five children, Lamarcus saw and dealt with more than his share of tough times as a youngster in the projects. But after vowing never to disappoint his mother, he stuck to a plan of using education and football as his escape. “I’ve been running away from that place all my life, which is why I do what I do on the field and in the weight room and the way I respect people,’’ the 23-year-old said. “I just kept my faith in the Lord. ... To add on to what he has already given me with my ability, I just added the extra work and listened to the great men in my life. For their part, the Rams feel similarly blessed to have Joyner, a talented and versatile defender who also can return kicks. “We’re really excited about him,’’ Rams coach Jeff Fisher said during a draft-day news conference. “He’s just an outstanding player. He played all over their defense. He played outside, he played in the slot, he played high, he blitzed, so he’s a plug-in day one nickelback. And Joyner, a hitter who plays bigger than his 5-foot-8, 182-pound frame would suggest, seems a perfect fit for the attack-minded scheme employed by new defensive coordinator Gregg Williams. After three seasons commuting across town to Southwest High to escape his neighborhood, Joyner finished his prep career at perennial private-school power St. Thomas Aquinas and was named USA Today national defensive player of the year. Marcus Roberson refuses to let what happened — or didn’t happen — during last month’s NFL draft hold him back. Roberson, who stands 6 feet and weighs 190 pounds, was highly touted coming into the draft, with some “experts’’ viewing him as a possible second- or third-round selection. But after three days and seven rounds, he still was available. He said he drew interest from several teams before deciding to sign with the Rams. The Rams, who held their first of 10 organized team activities Tuesday at Rams Park, addressed a need by adding a number of cornerbacks in the offseason, including sixth-round draft pick E.J. Gaines from Missouri as well as rookie free agents Roberson and Greg Reid (Florida State). Holdovers at the position are starters Janoris Jenkins and Trumaine Johnson, plus backups Brandon McGee and Darren Woodward. In addition, second-round draft pick Lamarcus Joyner (Florida State) and rookie free agent Jarrid Bryant (South Dakota) are listed as defensive backs, capable off playing corner or safety. Spirited competition is nothing new for Roberson, a product of perennial national prep power St. Thomas Aquinas High in Fort Lauderdale, Fla. It led all high schools in drafted players this year, with four — Joyner by the Rams in the second round, Wisconsin safety Dezmen Southward by the Falcons in the third round, Miami guard Brandon Linder by the Jaguars in the third round and Wisconsin running back James White by the Patriots in the fourth round. In 2010, when Roberson was a junior, Aquinas went 15-0, captured the Class 5A title and ended up ranked third nationally. So who was the true shutdown cornerback on that squad, Joyner, the senior, or Roberson, the junior? Should the Rams release Kayvon Webster? The Rams could save about $3M in cap space by releasing him/reaching an injury settlement. If that money would allow us to, for example, re-sign Nickel Robey-Coleman, I'd probably consider it.